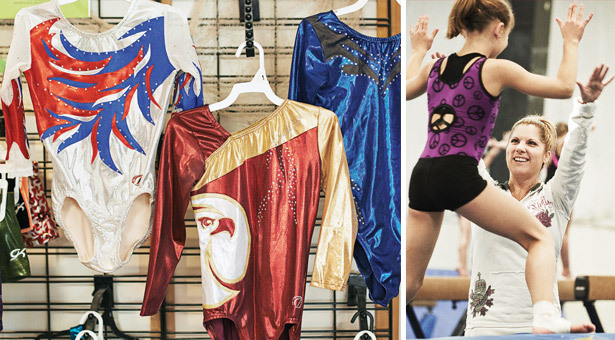 Tammy Sutton Carney ’91 creates colorful, customized competition leotards through Daredevils Activewear. Her customers include the SPU Falcon gymnastics team. 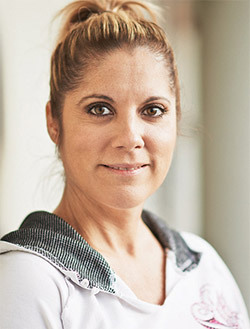 For Tammy Sutton Carney ’91, it started on a whim. Well, that and a $55 budget. On the day 15 years ago when she caught sight of an attractive competition leotard, the only thing going through the mind of the former Seattle Pacific University gymnast was how she wished she could afford a dozen of them for the young girls she was coaching at a club in the Seattle suburb of Bellevue. As good as that leo looked, even a single one of them was way out of her price range. “I was frustrated because it was $110. Our budget for competition leotards was only $55 at the time,” says Carney. “So I ordered one and took it apart and tried to make one — and I made one. Then I said, ‘Well, 12 of them won’t be that difficult. Job finished, Carney unplugged her sewing machine and returned her focus to coaching. But then, those leotards took on an unexpected life of their own — and Carney’s life took an unexpected turn. What initially was a way to stay within her own team’s limited budget gradually became Daredevils Activewear, all done out of Carney’s home in Bothell, about 20 minutes northeast of SPU. Gradually, the volume of business — which includes coach Laurel Tindall’s Seattle Pacific program — reached a point where Carney couldn’t handle it all. So she partnered with another gymnastics coach in the Portland area to help with some of the production load. That gymnastics is still a significant part of Carney’s life should come as no surprise. It essentially has been her life since she was about 7. Although Carney acknowledges that wasn’t the best way to approach things, she did become a champion. She won three state titles for Lindbergh High School in Renton, about 20 miles southeast of SPU, then captured four regional crowns and earned three All-American honors for Tindall’s Falcons. As her business started to boom, Carney left coaching to focus more on that. After two-and-a-half years away from coaching, she was approached earlier this year about a position at Cascade Elite Gymnastics in Mountlake Terrace, just north of Seattle, and decided to commit to it. Daredevils Activewear gets a considerable amount of her attention. But Carney has come to realize that life doesn’t have to be all about business or coaching — or even gymnastics. “[Doing the leotards] was a way to be creative, and I love doing creative things,” she said. “The best world I’m seeking now is to inspire [my gymnasts] to be great young women and athletes.